“I’ve never been to Fort Kochi“, she mumbled, as she sat staring out of the car window, absorbing the scenes whizzing past. My mother spends most of her time indoors nowadays, and I was taking her out on a drive, that I hoped, would be a welcome change for her. 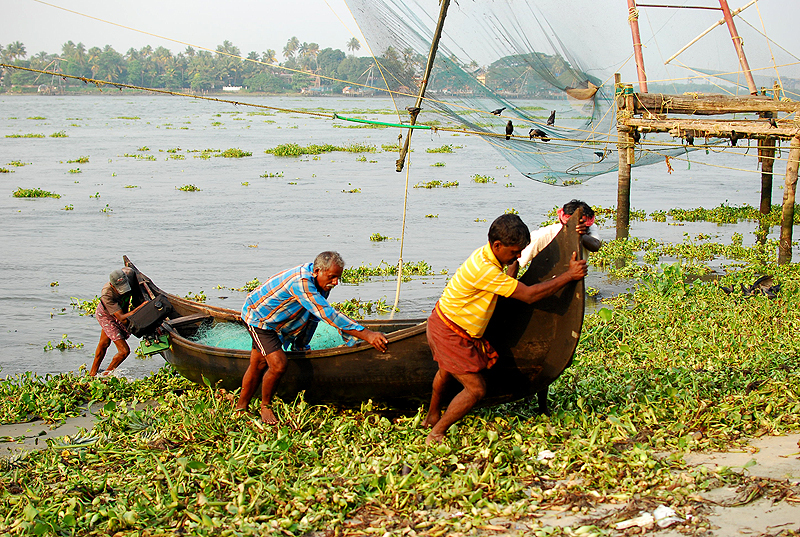 Now aged 72, she had lived all her life 15 kilometers away from Fort Kochi – in the ‘other’ Kochi; the mainland part (referred to also as Kochi or Ernakulam). Yet, this will be the first time that she sets foot in Fort Kochi! It may sound incredible, but I suspect this would be the case with many people living in Ernakulam. This route we were taking would cover the regular route she used to take to get to her college when she was working. I could see her eagerly soaking up the scenes and the changes time and development had brought about. Occasionally she would recount an old story about a place we just passed. This trip, I could see, was turning out to be a journey down the memory lane for both of us! As we drove past Thevara junction, and on to the new Mattancherry bridge, we could see the iconic old Mattancherry bridge, now semi-retired, running alongside us. As a child growing up in the mid 70s and 80s in Kochi, the Mattancherry bridge was a bigger wonder than the 7 wonders for me – for this was one of those bridges that would open up to let ships go across! I faintly remember having seen this in action too – though I can’t be sure. Was it active in the 80? I would need to check on that. I remember us having to wait on the bridge for vehicles from the opposite direction to pass, and when they did, we could feel the bridge (and our car) rock up and down. Another iconic structure we passed was the huge red beam crane – known to me as the ‘150 tonne crane’. I heard this name for the first time from my father, who used to work in Cochin Shipyard. The introduction of this crane to Kochi skyline was big news, and I remember watching it wide-eyed every time we passed through the bridge. Another memory that comes gushing up when I think of Cochin Shipyard is that of the lost ship ‘Kairali’. Kairali was docked in Cochin Shipyard, and my father had taken us aboard to visit a friend who was part of the cruise. I remember dangling helplessly on a white rope ladder trying to get aboard (I wonder why they didn’t use the solid detachable staircase). Later we would hear the disturbing news about the disappearance of this ship. Ooh, ooh – there’s another important one; one related to food. There used to be a restaurant called Tima located in Ravipuram, opposite Deepa Theater. Wait, I got that wrong, didn’t I? Deepa Theater is no longer known by that name – I don’t know what it’s called now. Anyways, Tima was opposite this theater. It is here that the locals got the first sight (and taste) of grilled chicken. That weird machine in which red colored chicken rotated and got slow cooked was a wondrous sight indeed! A crowd used to gather around in the evenings just to see those chicks getting roasted. If they’d sold tickets to let people watch the machine, I’m sure they would’ve collected a decent sum. I don’t see the restaurant there now – guess they’ve demolished it. As my mother and I were navigating through our past mentally, my physical self was steering our car on autopilot mode to Fort Kochi. 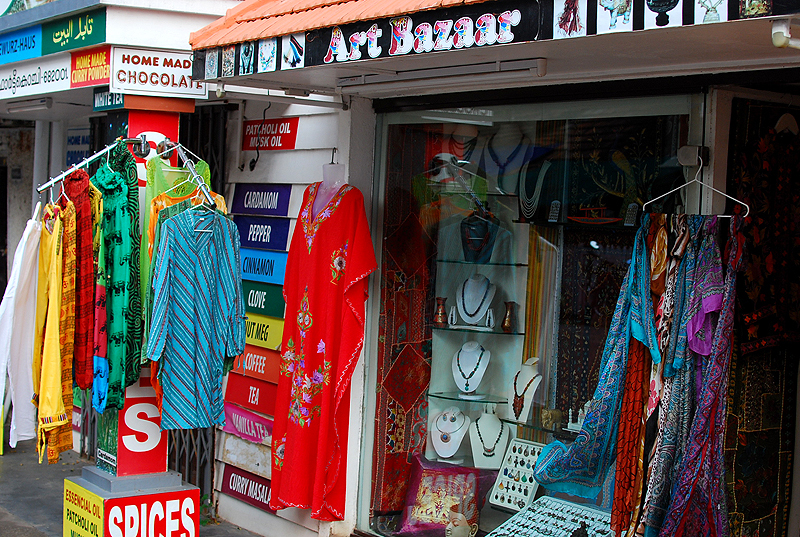 Fort Kochi feels different from the mainland part, and is a great place to just walk around. 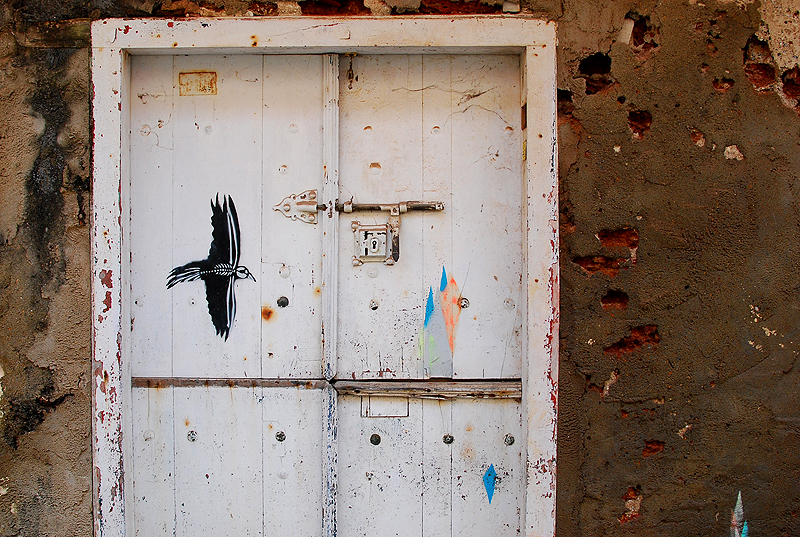 Fort Kochi is a haven for creative minds; you can find art everywhere – on trees, walls, cafes, anywhere and everywhere! 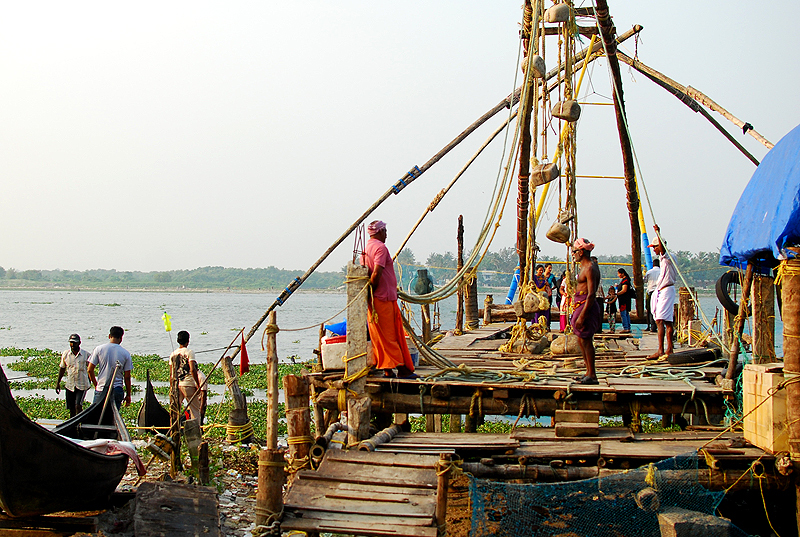 (Also read: my experience at Kochi Muziris Biannale that was held in Fort Kochi recently). Creative juices flow through the art-tree! I parked our car in front of Burgher street, and since my mother finds it difficult to walk for long, I helped her onto a concrete structure (with a ship’s anchor stuck in) overlooking the Vembanad lake. 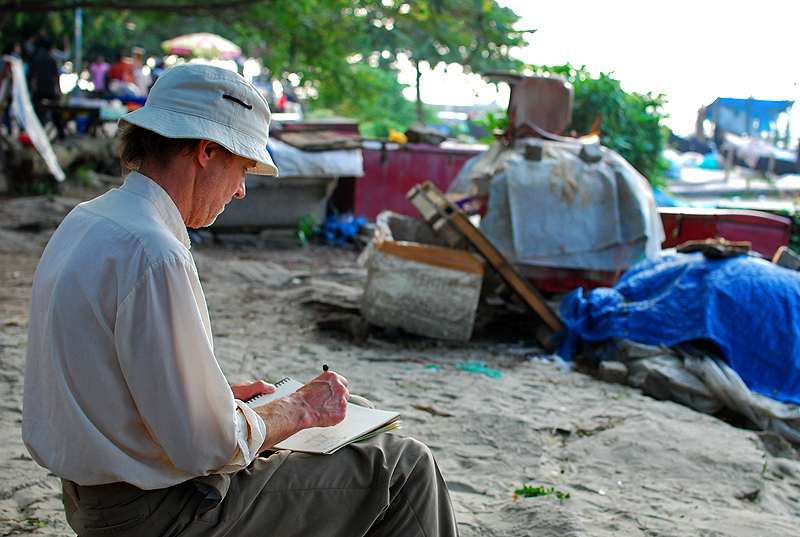 The area was buzzing with tourists (local and foreign), fishermen and street hawkers. I strolled along the concrete walkway that ran along the shore. Along the walkway, you can find a number of Chinese fishing nets, all of them reinforced with steel rods. 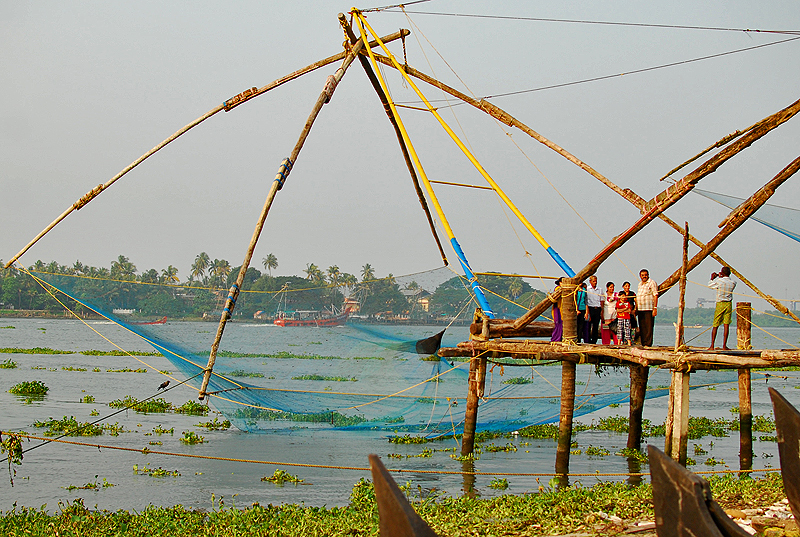 Apart from being used for fishing, these nets now also serve as a tourist attraction. I saw the operators letting tourists climb onboard, operate the nets, and get photographed. 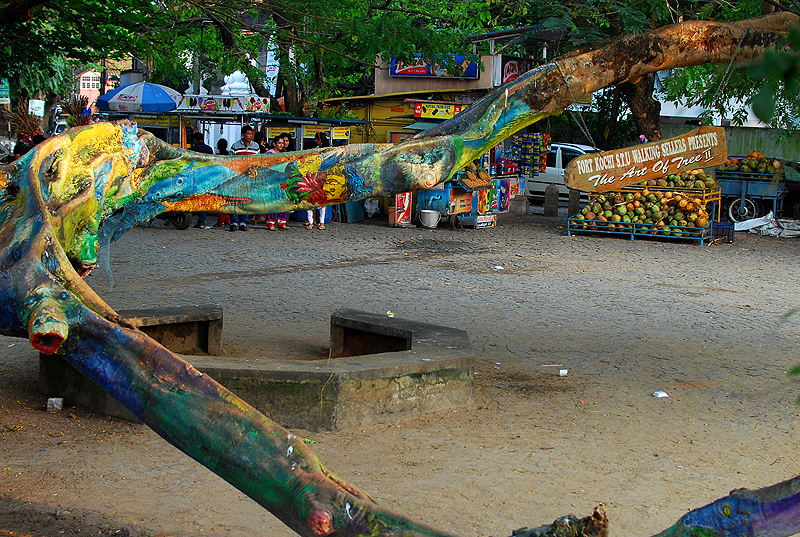 They were also selling the fresh catch right from there – crabs, lobsters, and fish. 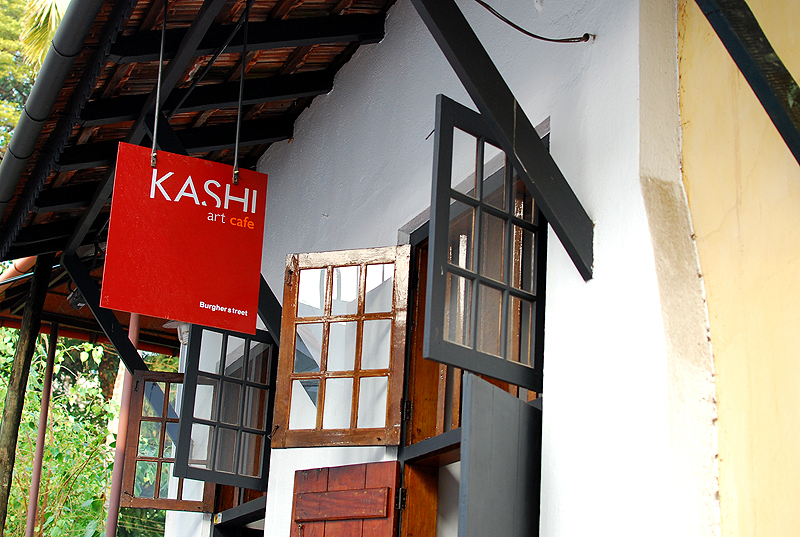 When you are in Fort Kochi, you have to make it a point to visit the cafes – Kashi’s art cafe located on Burgher Street is lovely. The line of roadside shacks right next to it is also good to sit around, but I wouldn’t recommend eating anything from those shops – for, even my strong, abused-with-any-kind-of-food tummy revolted after eating a sandwich from there once. But don’t hold that against them – try them too and decide for yourself. Walking around the narrow streets, you will also come across big old bungalows (now converted to offices or hotels), colorful little shops that sell curios, clothes and other touristy stuff. 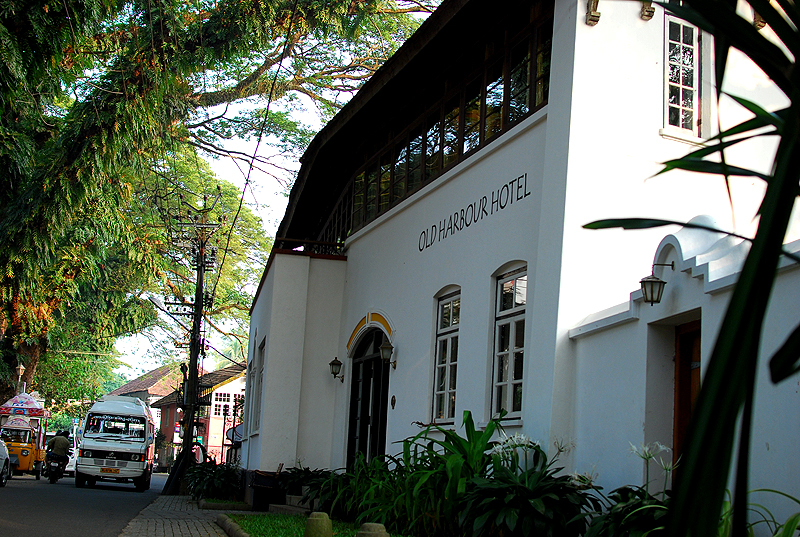 Old Harbour Hotel: More than 300 years old! The Sun was coming down, and so I walked back to where my mother was sitting. The concrete structure where she was sitting was now filled with people; people who looked like they met here every evening. One of the guys had old Hindi songs playing from his mobile, and was discussing the day’s happenings with his gang of friends. As I helped my mother into our car and prepared to drive back, I caught a glimpse of the dark silhouettes of the Chinese nets against an orange-ish sky. Another day had come to an end – a memorable one that had me time-traveling back to my growing up days.